This has to be the best of all the Sherlock Holmes movies. Directed by the great Billy Wilder, this movie brings us the iconic Holmes, playing the violin, smoking his pipe and reaching for his needle in times of pain and boredom. It showed the private life of Holmes, the life that didn't make it into the pages of Strand magazine. It showed a Holmes who was human, but it also remained faithful to the Arthur Conan Doyle character. It showed us a Holmes who had been disappointed in love. 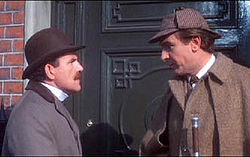 He says to Watson, "You've given the reader the distinct impression that I am a misognist. Actually, I don't dislike women, I merely distrust them." The movie had an interesting, twisting plot with a nice part for Christopher Lee as Mycroft Holmes. It also had midgets, canaries, monks, the Queen and the Loch Ness monster. But most interestingly it had an vulnerable Holmes, outsmarted by a woman who he seems to fall in love with.